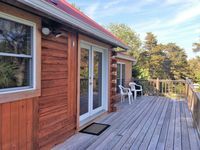 Properties in Petit Manan Point average 4.8 out of 5 stars. 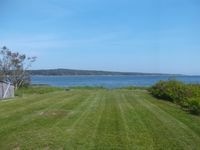 Property 26: The Natural Beauty of Downeast, ME surrounds Pyne Cove Cottage and welcomes you! Property 30: Ocean front house with two private beaches-- on a peninsula--spectacular views! Thank you Kim and B for sharing your little piece of paradise with us! We were looking for something peaceful and relaxing and this quaint log cabin was perfect! Since the temps were falling at night, Kim provided us with a space heater, which worked perfect! Our favorite place was Acadia on Schoodic peninsula just 15-20 minutes away watching the wave crash in. We did check out Bar Harbor and drove up to Cadillac Mountain, which was beautiful; however, that is where all the people were. If you are adventurous and like a good, steep climb, Tunk Mountain was quite the adventure. Upon reaching the top, the view was breath-taking. Highly recommend this little gem! !